Kimpton Hotels and Restaurants prides itself on the personalized connection between hotel staff and guests. In order to be successful, their IT infrastructure needs to be agile, secure, and reliable. After deploying EMC converged infrastructure from VCE, Kimpton achieved a 25 percent reduction in operating expenses, and they can now stand up virtual machines (VMs) in minutes to capitalize on business opportunities, compared to days or weeks with the old infrastructure. 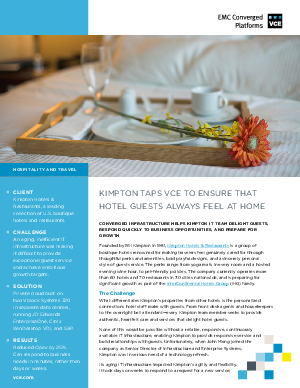 Read this customer case study to find out more about how Kimpton was able to reduce their costs while improving the performance of their IT environment.